Simple steps to make your cafe more accessible! Simple steps to make your café more accessible! Chris recently emailed us looking for some advice. He is about to open a small café in Halstead in Essex and he wants to make it as accessible as possible. He doesn’t have a very big budget but he wants to make sure that everyone feels welcome in his café. So we had a look through our reviews of cafés and picked out some of the things our reviewers have told us they love. 1) Offer to carry food and drinks to the table. Some people find it difficult to carry objects and it is a good idea to ask if they would like a hand. If the customer has a visual impairment, let them know where you have put their tray. Imagine there is a clock face on the tray and describe the position by saying ‘your coffee is at one o’clock’. For some people, a cup and saucer can be challenging to hold and they may prefer a mug. Others may wish to use a straw. Having a range of options is a great way to make people feel welcome. 2) Moveable tables and lowered counters are awesome. Wheelchair users sometimes need a little more space to move around and if tables are fixed to the floor, they can become obstacles. Movable furniture allows more flexibility for everyone but there should be a clear and obvious pathway free from obstacles, for visually impaired customers and staff. A lowered counter makes it easier to place orders or pay the bill. If there isn’t enough space for a lowered counter, ask customers if they would prefer to order from their table. 3) Customers can’t buy anything if they can’t get in the cafe! Always offer assistance with opening the door and if you have portable ramp, make sure there is a sign to inform customers that a ramp is available. A simple wireless doorbell, at wheelchair height, provides an easy way for a disabled person to let you know they need assistance. Permanent ramps and automatic doors make it easier for customers to wander into your café. They are a great feature that will attract clubs and people looking to host meetings to your café. 4) Install an accessible toilet. An accessible toilet is a toilet with a wide step-free entrance that is equipped with grab rails and an alarm to attract attention in the event of an emergency. Small details like having lever taps and paper towels make a huge difference. Never store anything, including over-sized bins, in an accessible toilet because this reduces the amount of space available for the user. The key to an accessible toilet is...the bigger the better! 5) Learn some BSL. Knowing British Sign Language (BSL) is becoming an increasingly useful skill to have. The exact number of BSL users in the UK is unknow but estimates suggest there are over 150,000 BSL users. It is also a good idea to keep a notepad next to the till to help people to communicate non-verbally. 6) Alternative formats. Printing a large print version of your menu and keeping it to hand, is an easy way to increase your accessibility! Some people may also wish to read your menu online. This gives people the opportunity to read the menu before they visit, if they need a little extra time. Having a range of alternative formats, including Braille and Easy Read formats, is the best way to make everyone feel welcome. 7) Clear signage. Make sure there is clear signage pointing to the accessible toilet with the symbol in a contrasting colour to the background. 8) Be welcoming! Don’t forget to make everyone feel welcome in the café and ask them if they need anything. 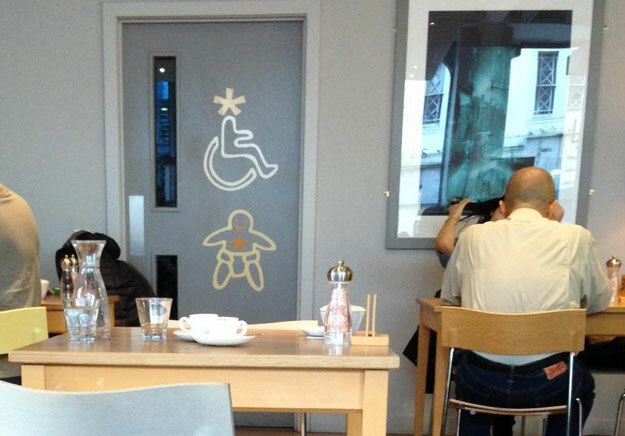 9) Tell everyone about your accessible cafe! Write to local disabled people’s groups telling them that you have opened and what facilities you have. Don’t be afraid to ask for feedback or for people to review your café on Euan’s Guide. You will be surprised how popular your accessible loo will be! If you’re not sure, just ask the customer! I don't think I would get through all the 'clutter' to get in to that toilet! Not without many of the other patrons having to move, and that is a big problem with a lot of venues. Their priority is getting as many paying patrons as possible, which means accessibility suffers for those in wheelchairs or those who use sticks.